Police have fired shots and tear gas in Congo’s capital, Brazzaville, in a clamp down on protests against the president’s bid for a third term. Texting and internet services have been cut and public meetings have been banned ahead of a controversial referendum on Sunday, residents said. The vote is aimed at pushing through changes to the constitution such as scrapping age and two-term limits. 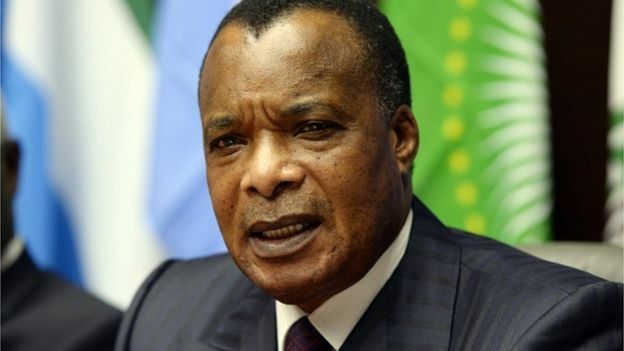 This would allow President Denis Sassou Nguesso, 71, to run for office again. Mr Nguesso is one of Africa’s longest-serving rulers, first coming to power in 1979 and ruling until 1992 when he lost elections. He returned as president in 1997 after a brief civil war and has since won two elections. An opposition coalition had planned to hold a rally in the city centre to protest against the proposals to be put to a referendum on Sunday. Angry youths have burnt tyres in Brazzaville’s southern Bacongo and Makelekele districts, sending plumes of smoke into the sky, the AFP news agency reports. There have been reports that a number of people have been injured in clashes between security forces and protesters. Other journalists told the BBC that most shops in Brazzaville were shut, and people were staying at home amid fears of violence. “People are demonstrating across the city. The police are firing tear gas bombs,” Tresor Nzila, head of the Congolese Observatory of Human Rights, told the Reuters news agency. 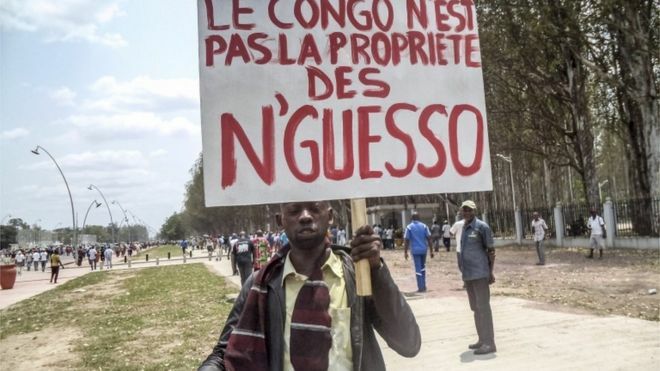 Thousands of protesters waved banners reading “Sassou get out” and “No to the referendum”, Reuters reports. The opposition have been campaigning under the slogan “Sassoufit”, a pun on the French expression for “that’s enough”. After the government announced a ban on public meetings, saying it expects people to work normally ahead of the referendum, the signal of Radio France International – which is popular in the former French colony – was also cut, AFP reports.